*Some really bored white boys with time on their hands have landed themselves in a jail cell after going on a spray painting field trip. 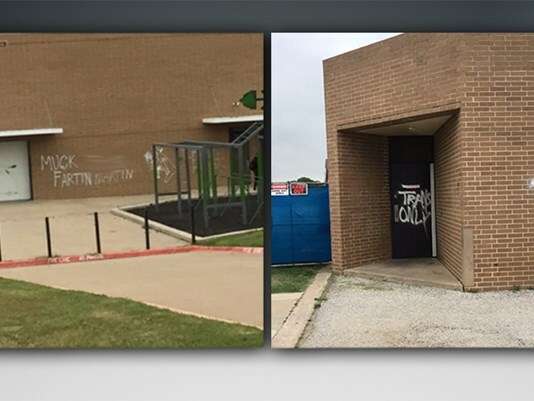 Students Christian Joeckel, Ryan Westbrook, Hayden Honolka, Cameron Bodenstab, and Ethan Sigmond, all of whom are from rival school Arlington High (in Arlington, TX), were arrested after it was discovered they were responsible for writing racist, vulgar and anti-transgender graffiti on the school’s athletic facilities and restrooms. The images were placed on Twitter. Joekel, Westbrook, and Honolka are all 17 years old; Bodenstab and Sigmond are 18. Will these fools ever grow weary from rubbing their joy sticks in racism and sexual innuendo? Seriously. You have no idea what the motivation was? Bodenstab and Sigmond both admitted to painting the jungle gym at the school green, but said they did not paint any of the other graffiti at the school. Honolka told police he painted monkey bars and wrote “F*** Martin” on the school. Charges against the teens include state felonies estimated at $20,000 in damage to school property. Hate crime charges may be brought about for the graffiti writings.